Cast your mind back to Shai Agassi’s inventive, entrepreneurial plan to build a network of charging stations for electric cars. Recall the audacity of his scheme to swap the exhausted battery packs of incoming cars, so that they could glide silently on their way after mere moments spent idling in the “switch station”. Turns out this vision is not quite as new nor as inventive as one might suppose. Mercedes-Benz was experimenting with this very technology all of, erm, 35 years ago. In 1972, Mercedes built an electrically powered people carrier called the LE 306. Its 31kW (42hp) motor could zip it along at 70km/h (44mph), with a range of 65km (40 miles). A contemporary press release explained that the battery could be “recharged during breaks or replaced using what is known as push-through horizontal-exchange technology”. In other words, a bloke with a pair of pallet-style trolley-jack things could shove the old battery out of the vehicle while winching the new one in, horizontally. “This procedure, which to a large extent can be automated, takes no more than the time needed to fill up a vehicle’s tank,” the release added. Fortuitously for the boffins behind the project, the 1973 oil crisis must have bumped their efforts up the priority list. According to Mercedes-Benz, a fleet of 89 prototype vehicles was built, trundling slowly through 2.9 million kilometres of tests. 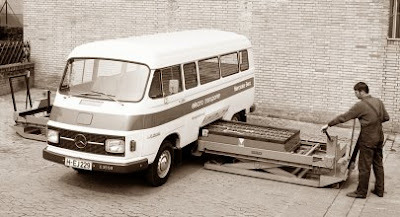 In 1975 the German boffins concluded that the system would be ideal for urban delivery vans clocking up less than 60 or so miles per day, but for longer distances they recommended a hybrid drive to supplement the electric motor with a diesel engine. Of course the oil crisis had ended in 1974, and the cost of the batteries killed off any production plans. As with the prophetically electric Lohner-Porsche, we can only wonder where Mercedes might have been today had it pressed on with battery swapping and electric people carriers.